Before W.W.II Leica and Contax were the only two widely available professional system 35's. Each had advantages and disadvantages. The photographer's choice said as much about their personality as it did about their photography. It's very interesting that these cameras were so different. I can't escape feeling the Leica is more of an artist's camera designed by an individual (Oskar Barnack) for picture taking convenience, while the Contax is more of an optical instrument designed by committee to combine as many features a possible. 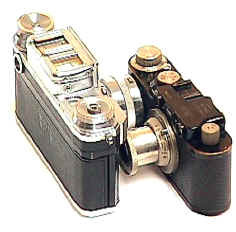 While the Contax I of 1932 was too unreliable to really offer Leica competition, the Contax II and III offered some advantages over Leica. It was no longer simple choice. Either system, of course, would give absolute top notch results. while Leica was the product of an upstart microscope manufacturer nobody in the camera business - Leica. The smaller Leica simply has a better feel in your hands, at least to most photogs. Of course, the Zeiss lover will retort it's the lenses, not the box, that takes the pictures! 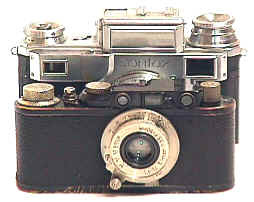 1936 saw a new entrant into the battle, the also German made Kine Exakta, the world's first production 35mm SLR. Exakta quickly expanded to a 40mm to 500 mm lens line up by 1938. 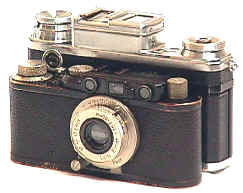 AFTER WWII, a new top 35 rangefinder manufacturer emerged, Nikon Kogaku and their "Nikon." Not too surprisingly, the Nikon One was a combination of features between Contax and Leica. Revised: November 07, 2017 . Copyright � 1998-2002 Stephen Gandy. All rights reserved. This means you may NOT copy and re-use the text or the pictures in ANY other internet or printed publication of ANY kind. Information in this document is subject to change without notice. Other products and companies referred to herein are trademarks or registered trademarks of their respective companies or mark holders.